Two faculty and one graduate student in the Division of the Humanities were honored for their excellence and commitment to teaching at all levels. Aden Kumler, Assistant Professor in Art History, received the Llewellyn John and Harriet Manchester Quantrell Award for Excellence in Undergraduate Teaching and Christopher Wild, Associate Professor in Germanic Studies, received the Faculty Award for Excellence in Graduate Teaching and Mentoring. Felipe Rojas, PhD student in Romance Languages and Literatures, received the Wayne C. Booth Graduate Student Prize for Excellence in Teaching. Teaching award recipients were honored in connection with the spring Convocation on June 15. Read about the awards and the complete list of winners here. The University of Chicago Press recently published Shakespeare and the Law: A Conversation among Disciplines and Professions, edited by Bradin Cormack, Professor in English Language and Literature, Richard Strier, the Frank L. Sulzberger Distinguished Service Professor in English Language and Literature, and Martha C. Nussbaum, the Ernst Freund Distinguished Service Professor of Law and Ethics. 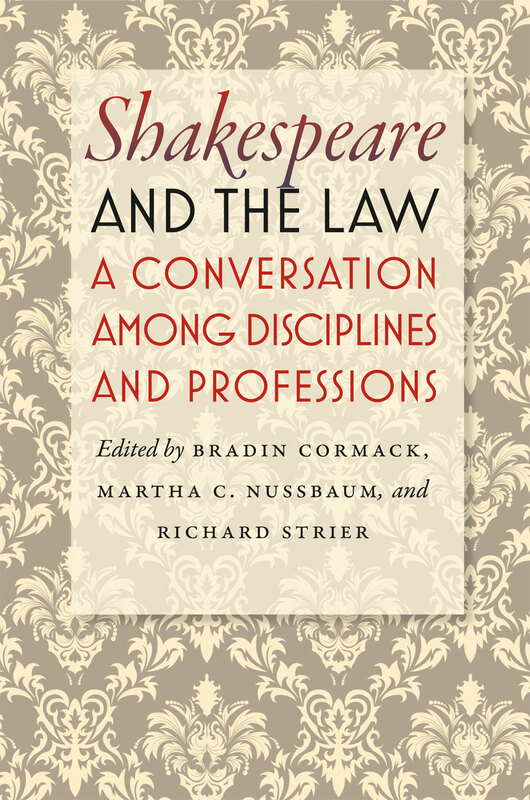 The book's four sections examine the relationship between law and literature, Shakespeare's awareness of the law, his attitude toward law, and how law enters into politics and community both in the plays and in our world. It closes with a transcript of a 2009 conference that inspired the collection, wherein Supreme Court Justice Stephen Breyer, Judge Richard Posner, Nussbaum, and Strier discuss the legal themes in Hamlet, Measure for Measure, and As You Like It. To read excerpts from the conference and learn more about Shakespeare and the Law, visit The University of Chicago Magazine. Bart Schultz, Senior Lecturer in Philosophy and Director of the Civic Knowledge Project, was honored with an "Outstanding Educator" award by the Rainbow PUSH Coalition. Rainbow PUSH, which seeks to enact social change by promoting economic and educational equality, recognized Schultz for his work to strengthen community connections among various knowledge communities on the South Side of Chicago through the Civic Knowledge Project.